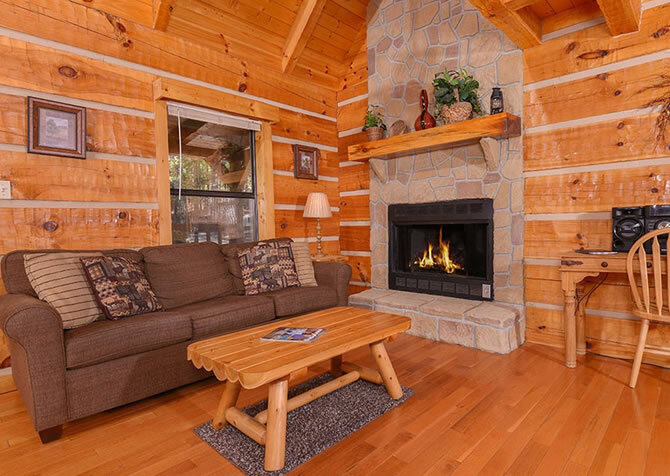 Get away from it all and unwind in the Great Smoky Mountains at Little Smoky Hideaway, a peaceful 1-bedroom, 2.5-bathroom, 3-floor cabin that sleeps up to 4 guests — perfect for small family trips, romantic escapes, or vacays with friends. 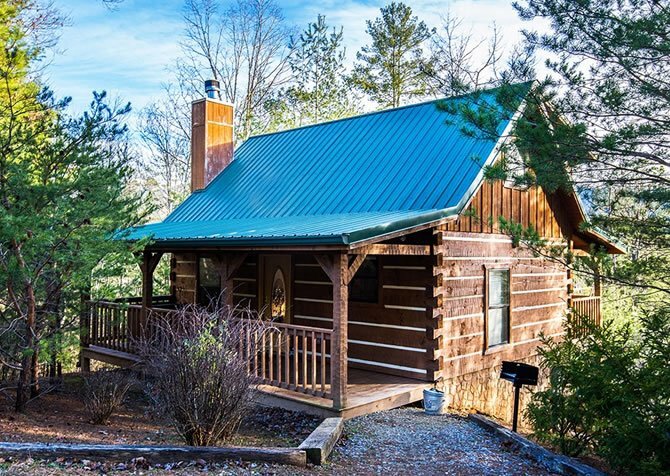 Featuring a beautiful mountain view, log interior, comfortable furnishings, and a quiet location, this lovely Pigeon Forge cabin rental offers the ultimate in relaxation. 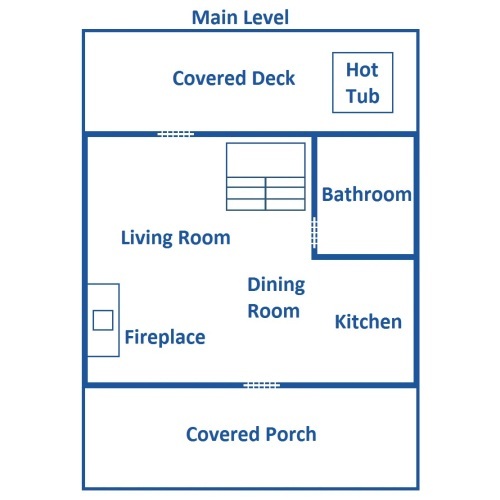 Spend every evening soaking in the steamy hot tub outdoors, every night snuggled in the plush king-size bed, every morning with a cup of joe on the porch swing, and every afternoon playing games in the rec room. You’ll also find a fully equipped kitchen for mealtime convenience, an indoor jetted tub for luxurious spa baths, and a stone fireplace for cozy chats and captivating reads. After you unpack your bags and explore the mountain home, sit back and unwind in the living area. With exposed log beams, hardwood flooring, and a stone gas fireplace, this space invites you to enjoy tranquil evenings. Kick back on the sofa (doubles as a queen sleeper) and arm chair with ottoman, turn on the television, pop in a DVD, and begin to feel the outside world slowly drift away. And on cool nights, a toasty fire is the best, so curl up with a blanket and a book and warm up in front of the crackling flames. Dream big when you vacation in this Pigeon Forge cabin rental and prepare bountiful breakfasts, lunchtime spreads, delectable dinners, and midnight munchies for you and your loved ones in the fully equipped kitchen. Stocked with everything from mixing bowls to spatulas and baking dishes to a coffeemaker plus all standard appliances, including a dishwasher, this kitchen has just about everything you need, so the only thing you have to bring along for meals in the Smokies is your groceries! Tucked by the kitchen window with tree-studded views is a quaint dining space for 2, with a wrought-iron table that boasts a unique tabletop design. 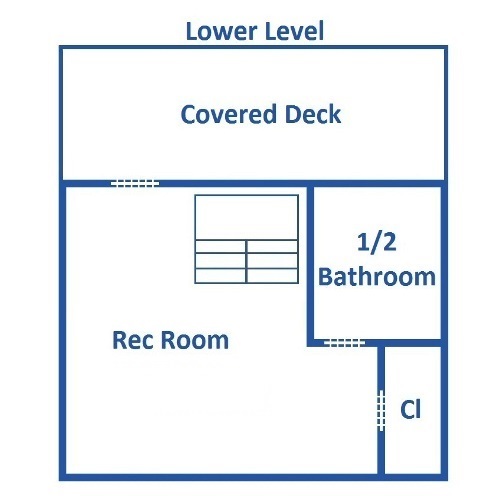 This space is also great for setting up a candle-lit dinner for your spouse, playing card games from home, or sipping coffee with the morning paper. 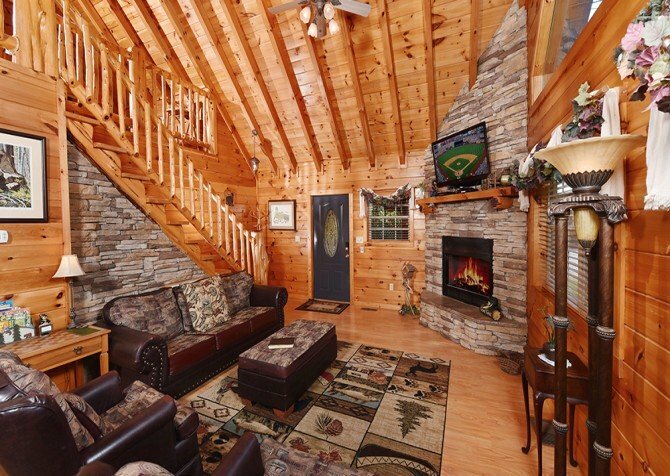 Spend evenings taking advantage of all the amenities that this Pigeon Forge cabin rental has to offer and head downstairs to the epic game room. This rec space features a pool table and air hockey table, providing hours of entertainment. The game room also features a glass door to the lower-level deck and an additional sitting area for those who prefer to cheer on the underdogs. 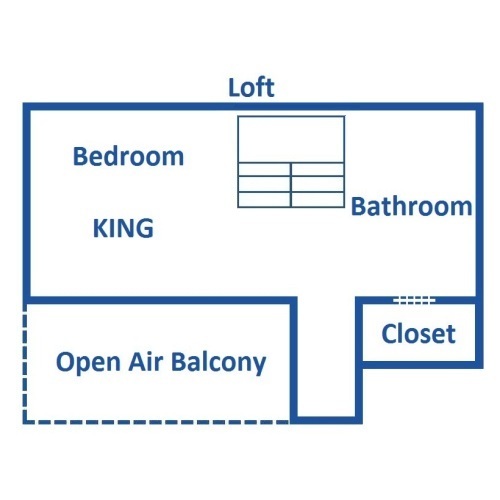 When you’re ready to hit the hay, retire to your cozy suite in the upstairs loft. This relaxing space offers track lighting, exposed log beams, and a window that overlooks an alluring view of Mt. LeConte. Turn on the bedside lamps and browse a magazine before drifting off to sleep in the king-size bed or flip on the mounted flatscreen TV for a little entertainment. In the mornings, awake from your slumber and draw a bubble bath in the indoor jetted tub…there’s not a more relaxing way to begin your day in the Great Smoky Mountains! When you arrive at Little Smoky Hideaway, you’ll be greeted by a flat, gravel parking area and only 2 steps into the cabin, making unloading your vehicle as easy as can be! This picturesque cabin rental offers a charming front porch, green roof, and stone chimney. Step through the front door and officially begin the vacation of your dreams! This semi-private, log cabin boasts a view of Mt. LeConte from both covered back decks and the master suite. This shady and quiet area is a great place to sip a glass of orange juice in the morning or gaze at the twinkling nighttime stars. 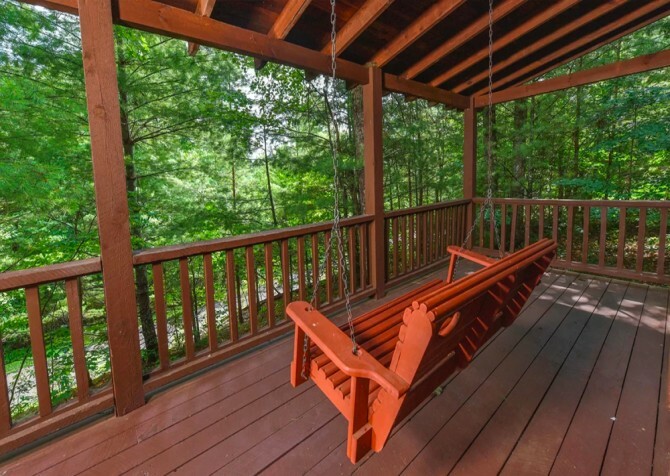 Enjoy a sunny afternoon on the porch swing or in the rocking chairs, barbecue feasts from the charcoal grill one evening, and climb into the hot tub to warm up on cool mountain nights. There’s nothing like the fresh mountain air and singing Smoky Mountain birds to soothe your worries away! Little Smoky Hideaway features another fun amenity the whole family can enjoy. Bring your favorite tunes for the CD player and host a dance party every night — groovy good times await! If you’re craving a little more action, the city of Pigeon Forge has just what you’re looking for! The local downtown Parkway is filled with dozens of attractions — you can spend your days visiting the Titanic Museum, browsing Old Mill Square, or checking out Parrot Mountain and Garden of Eden. Take your sweetheart to The Island for a ride on the Great Smoky Mountain Wheel or enjoy a hearty laugh at The Comedy Barn Theater. Once you’ve explored all Pigeon Forge has to offer, feel free to head over to Gatlinburg for even more fun! After all, you get the best of both worlds at Little Smoky Hideaway as it’s located between these 2 famed Smoky Mountain towns. The great outdoors awaits at Foxfire Mountain Adventure Park, featuring ziplines, walking trails, a rope jungle, ATV tours, and more! Looking forward to animal-watching on your trip? Head to Parrot Mountain and Garden of Eden, where tranquil gardens are filled with picturesque landscaping and feathered friends. Get ready for an unforgettable time at Dollywood, the famed amusement park of the Smokies, with daredevil rides, mesmerizing musical performances, fun festivals, sinful sweets, and souvenirs aplenty! "We enjoyed this cabin and its privacy so much! With all the activities it had inside the cabin, we never got bored. We definitely recommend Cabins for you and specifically Little Smokey Hideaway cabin! Can't wait to schedule our next visit in these wonderful cabins!!" It's so great to hear how much you loved your cabin stay at Little Smokey Hideaway! There's so much fun to be had at this cabin, and we couldn't be happier about your wonderful stay in the Smokies. We can't wait for your return to your Little Smokey Hideaway! "We absolutely loved it! We stayed at Little Smoky Hideaway. Beautiful cabin, very clean and well-kept, spectacular view. Very welcoming! The bed slept wonderfully and the hot tub was amazing! We were very happy customers! Thanks Cabins For You for a wonderful stay!" "We loved staying at our cabin, Little Smokey Hideaway! It was filled with activities so we never got bored. Definitely worth booking with them!"